The fact that YouTube has a number of the original Star Trek series is pretty cool for geeks like me who grew up on the series. This one below shows an upload date of over 43 years ago. 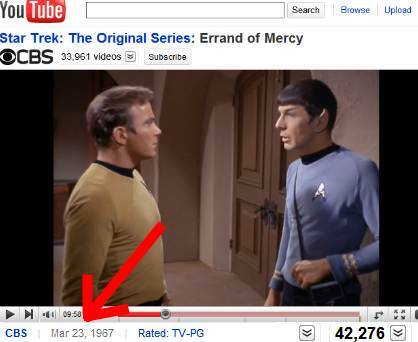 You think Roddenberry was time-travelling and uploading them to YouTube then? 🙂 ARPANET deployment was still a couple of years away when this episode was made.